Yesterday, it was just confirmed by Canon that the 5D Mark III has a light leak problem that can ruin the camera's ability to properly meter exposures. In its press release on the problem, Canon said that it is 'looking for solutions' as we speak. Unfortunately, the problem appears physical rather than in firmware, which will probably mean a total recall at some point in the future. For Canon, this is the last thing that the company needed after a string of quality issues and strong competition in the pro market from Nikon. Of late, Canon has had a lot of duds in its flagship cameras. First, there was the infamous 1D Mark III AF problems. As for the 1DIV, there was nothing wrong with it, but it was just not very impressive when pitted against the Nikon offerings. 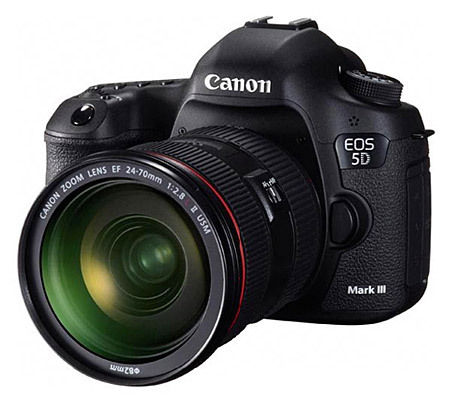 The 5DII? Well, its sluggish performance and antiquated AF system made it look like a dinosaur compared to the D700 and over-priced when pitted against Sony's $2,000 A850. While not a dSLR, Canon's revolutionary G1X was found to have a light leak in the shutter. Also, just a few days ago, Canon announced that the 1DIV's successor, the 1Dx, was being delayed again, this time until June. For the 1Dx, this marks the third delay in ship date. Needless to say, things aren't looking good for Canon. With the 5DIII, Canon finally produced the camera that many shooters all over the world were begging for: essentially a half-height 1D with many of the top tier model's features. Oh, yes, it beats the Nikons for the all-important high ISO performance, too. Well, a lot of people were very, very excited over the 5DIII and the prospect of finally having that all-around performer that Nikonians had in the D700 since 2008. Well, it looks like the 5DIII is shaping up to be another 1DIII: a much-hyped camera with a fatal flaw. For canon, this is the last thing the company needs and it couldn't have come at a worse time. Ever since the 1-2 punch of the D3 and D300 in 2007, Nikon has undeniably taken the lead in the pro market segment. Throw in the D700 a year later and, overnight, a lot of pros who either long-since dumped their Nikon gear in the late 80s or who would have never considered Nikon before that point were flocking back to the manufacturer that had dominated the pro market until the AF revolution. Nikon's new-found dominance in itself is bad for Canon. The second bit of bad timing: the latest Nikon flagship, the D4, was not all that big of an upgrade from the D3 it replaces. While the D3 was leaps and bounds ahead of the D2 line, the D4 was evolutionary, not revolutionary. Unlike from D2 to D3, there was no dramatic jump in image quality or shooting capabilities. Instead, the D4 merely added a few Mp to the sensor and full HD video, nothing that could scream “buy me!” to a lot of people still happy with a D3. Long story short: Nikon mopped the floor with Canon from 2007 to 2011 and, with its latest generation of cameras, left the door wide open for Canon to finally catch up thanks to the modest improvements. So, what does Canon come up with? A flawed 5DIII and a 1Dx that, for reasons still undisclosed, is still not ready for mass production. In the end, Nikon looks poised to win the battle for the 4th generation of pro cameras not because of what it is doing to revolutionize the way the world takes pictures, but for the mere act of not screwing up its products like Canon has done a lot of in recent years.